ITI, Diploma and Graduate Degree Passed interested and wiling applicants find latest Apprenticeship Jobs in Government Sectors and Public Sector Companies. 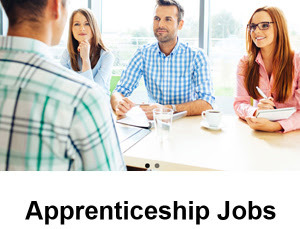 Apprenticeship Training Government Jobs means the Apprentice Trainee vacancy to be fill up via one to three Years training period basis. During the training period, the applicants will obtain pay scale for every month. After successful completion of training, the eligible aspirants posted for Regular Government Posts (Gazetted / Non-Gazetted). Apprentice government Jobs for ITI/ Diploma/ Engineering Graduates pass applicants available in Railway sector, Banking sector, State Electricity Board, PSU, Central and State Government Departments. The Latest Apprentice job advertisement will be updated in the given below table.